This trip will be to the island continent of Australia that is home to unique species that cannot be seen anywhere else in the world. Australia also offers visitors diverse ecosystems, including the Great Barrier Reef and moderate and tropical climates. At the same time Australia is a relatively young country, with a distinct culture, and a unique history. Modern Australia is the result of its geographic isolation, its unique history, and the blend of ancient and modern cultures. Students will travel the east coast of Australia from Sydney to Cairns. As part of the experience students will visit the Blue Mountains, hike to Wentworth falls, snorkel the Great Barrier Reef, visit the Rainforest Station Aboriginal Cultural Center, visit the Australian Zoo, and go white-water rafting on the Tully River. A home stay with Australian families is planned as part of the visit. Days 2 - 3 - Blue Mountains - Featherdale Wildlife Park, view the 3 sisters, take day hikes and view the flora and fauna in the Blue Mountains, and Wentworth falls.. Accommodation Camp Fletcher. Days 4 - 7 - Sydney and surrounding area. 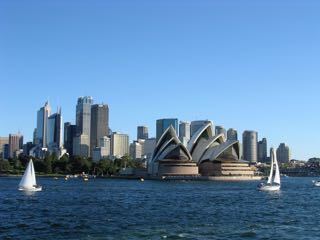 Visit the Sydney Opera House, Sydney Aquarium, Sydney Harbor, the Botanical Gardens, tour of The Rocks, etc. Optional ferry trip to Manly Beach. Worship at Hillsong church. Days 8 & 9 - Travel north up the eastern coast of Australia to Evans’ Head and Coff’s Harbour (banana plantations). Accommodations: Camp Drewe. Days 10 & 11 - Travel north through Byron Bay, visit the Byron Bay lighthouse, to Surfers’ paradise. Australia’s Gold Coast. Free day - optional tours. Days 12 - Visit Australia Zoo - home Stay with families from the Gasshouse Country Baptist Church. Days 13 - Travel north to the Big Pineapple and pineapple plantations to Gin Gin. Days 14 - 16 - Cross the Tropic of Capricorn, to McKay for sightseeing. On to Airlie Beach for trips out to the Whitsunday Islands and the Great Barrier Reef to view marine life such as giant clams, tropical fish, coral reefs, etc. Day 17 - Travel north to Townsville and Mt. Spec National Park. Accommodation: New Life Pastures Camp, Kennedy. Whitewater Rafting on the Tully River. Visit Kuranda, Atherton Tablelands, and learn from Aboriginals about their culture, including music and dance, and even how to throw a boomerang. Day 21 - Return to Portland from Cairns.